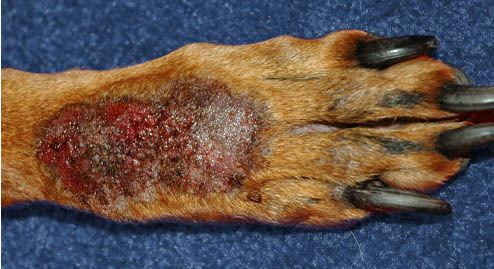 Skin disorders can be painful for your pet and diagnosing the cause can be difficult. Skin disorders can be caused by parasitic infestation, allergic reaction, or non-infectious disease and must begin by ruling out one possibility at a time. Our Veterinarians believe in trying the simple solutions first before ordering the more expensive diagnostic tests and treatments. The frustrating part of dermatology disease is that in some cases the condition can only be managed and not cured. This is a picture of a lick granuloma. The first step is to obtain an extensive history along with a physical and dermatological exam of your pet. A skin biopsy or skin scrape may be taken to determine the cause of your pet's skin ailment. In some cases, underlying causes may not be able to be determined and symptoms can only be managed. We are here to help you with many theraputic options. If your pet has any skin abnormalities, just won't stop licking that one spot or itches constantly, give us a call and we can help.